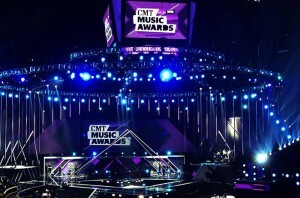 The 2013 CMT Music Awards was staged at the Bridgestone Arena in Nashville, Tennessee and featured a spectacular lighting design by Tom Kenny. The fan-voted awards show featured a stunning rig which included 24 of Robe’s newest moving light fixtures, the Pointe, along with a variety of Robe’s other ROBIN series moving heads. 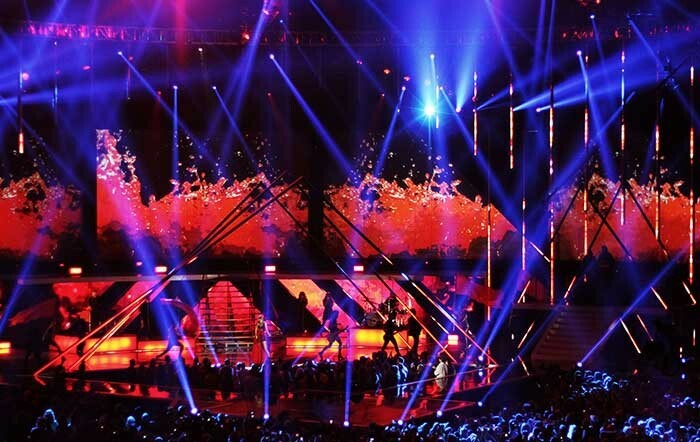 After a successful show with the brand new Pointe, just previously used on the MTV Upfront Presentation in New York, Kenny specified the versatile and multi-functional fixture for the CMT Music Awards. 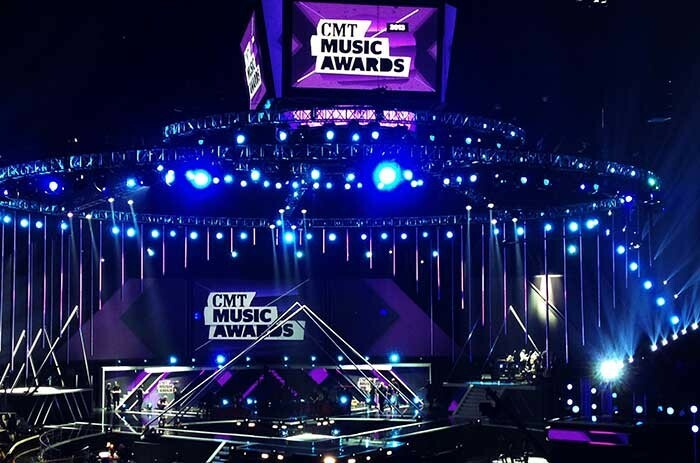 This was the fifth year that Kenny has designed lighting for the CMT Music Awards, a live show, broadcast on CMT (Country Music Television) and attended by a live audience in a venue with a capacity of 15,000 people. The creative team included lighting director and programmer Michael Appel, lighting programmer David “Fuji” Convertino, scenic designer Anne Brahic, video content producer/designer Tim LaValley and video programmer Loren Barton. Their visual collaboration produced another memorable show to honour the very best in country music. The lighting equipment was supplied by VER, and all of the Robe equipment was located on the deck of the multi-layered stage set. The Pointes were used as the main lights in that position, all of them directly upstage centre. Twelve were set on the main deck and twelve on another elevated deck about ten feet above the main stage and performance area. The expedient and unobtrusive size of the Pointes meant they could be left on stage throughout the entire event. They were a real workhorse of the show, featured in almost every look, scene and performance. Kenny has incorporated Robe products in his work for some time. He is always keen on being the first to embrace and road test any new technology, and was delighted to be able to use Pointes again after the MTV Upfronts at the Beacon Theatre in New York. In the larger and very different arena setting, they still “blew us away with how much brighter and more fun they are to use than other products,” he enthused. Appel particularly likes the Pointe’s wide zoom range, rotating gobos, six-facet linear prism (it also features an eight-facet circular prism) and the super-bright tight beam. “We were able to put these features to good use on this production,” he reports. In addition to the 24 Pointes, the rig included Robe ROBIN MMX Spots, LEDWash 600s and LEDWash 1200s. The LEDWashes were used as ‘shoot’ lights to fill the camera frame with attractive backgrounds and add generally to the excitement of the bumpers, awards presentations and live performances. The LEDWash 1200s were positioned on the main and auxiliary presenter stages, with the 600s rigged on offstage booms stage left and right of the main stage on the arena floor. Both Kenny and Appel love the individual LED ring control on these fixtures, which is great for in-camera effects. The MMXs were used as floor lights behind the Nationwide Insurance performance stage. The show was presented by Kristen Bell and Jason Aldean, and the evening’s big winners included Carrie Underwood, Miranda Lambert and Florida Georgia Line. Taylor Swift brought the house down with a rocking performance of the title track to her current album, “Red”.